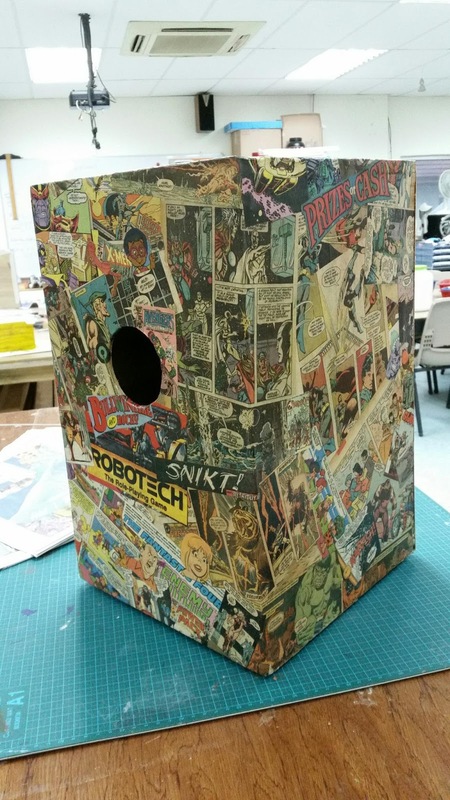 I picked up a bunch of old comic books for my kids at an outdoor market last year and when I found them a few months later with covers torn off and pages falling out, I thought they might make cool wallpaper or maybe covering some furniture. A little research uncovered the tradition of decoupage--decorating walls and furniture with coloured paper--that dates back hundreds of years. Some artists will create a collage of images, while others will create a single picture or design. On furniture, the paper is usually covered with a number of coats of varnish. There are fine examples in museums all over the world. This decoupage screen can be found at the Victoria & Albert Museum in London. While I was making cajon drums with grade 3 and 4 students (more on that in an upcoming post), we got an idea to try some decoupage on one of them see how it went. We found a recipe online that suggested mixing white PVA glue 1:1 with water, but this ended up soaking up the papers and causing it to buckle as it dried. We bought a few containers of Mod Podge and that worked better. One of our craftier teachers here suggested that I try using a spray adhesive first, to get the pages to stick, then use the Mod Podge overtop and that worked the best. 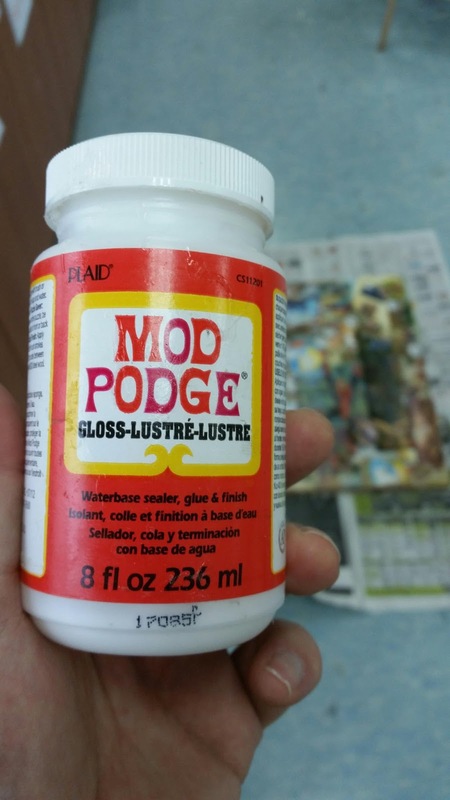 Since the Mod Podge runs about 8 dollars for a single container, this also helped it go a bit further. 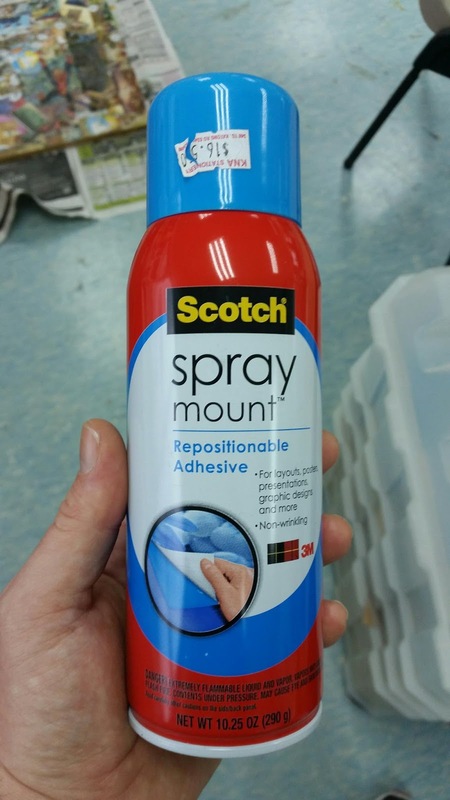 I've worked with a few brands of spray adhesive this year and really like the 3M stuff. The other ones I used get gummy around the nozzle, but this one works great every time. I'm very happy with how they look and they have been able to handle kids sitting on them and beating on them without peeling. 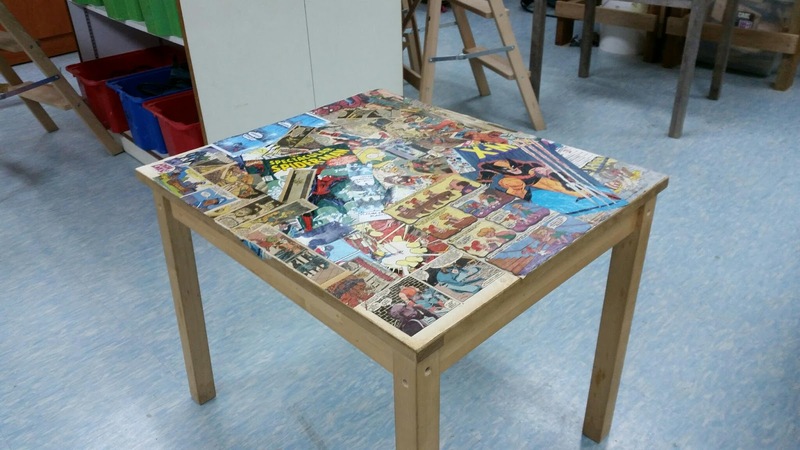 When our librarian saw them, she asked for us to do a couple of tables that she had in the library. The EdTech coach at our school runs a book club for boys, Books for Blokes, and they were keen to take up the challenge. We were thrilled to find a new way to help some reluctant readers develop a deeper connection with the library. The Mod Podge provides a pretty thin protective layer that isn't really enough for heavy use, but it will protect the paper well enough that you can put a proper varnish overtop without discolouring or damaging the paper underneath. 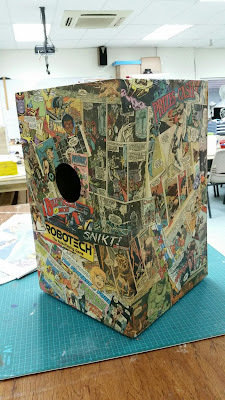 This was a great project that the kids really enjoyed. 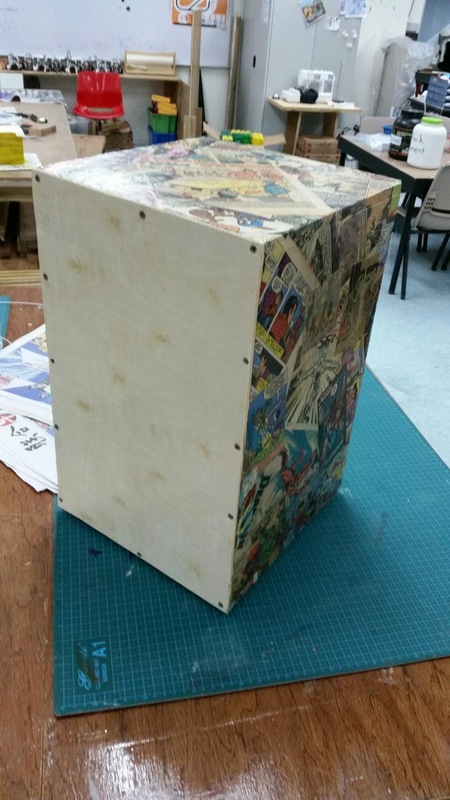 And as far as educational outcomes go, the Marvel vs. DC arguments certainly justified the time that went into it.